A further safety audit site visit was undertaken on 21 March 2019 by a team comprising: representatives from Road Safety Initiatives LLP (independent specialists, appointed by the developer), WSCC Highways and Sussex Traffic Police. The PC Clerk attended in an observing capacity and this report is based on the Clerk’s understanding of what the audit report is likely to recommend (although it is likely to be some time before a formal doc emerges and the developer, who is responsible for the works, responds). 1. Southerly build-out: this feature is considered to be functioning effectively & safely. 2. Visibility from Abingworth Crescent north jct: is now considered to be satisfactory. a) further improvement of northbound visibility by removing part of the close-boarded fence line behind the Massey Close properties nearest the pinch point. This is actually a double row of close-boarding to create a walkway for garden/bin access, and it is considered feasible to remove the outer line of fence (replacing with post + rail) without affecting the householders’ amenity. This could appreciably improve the sightline. e) adjusting the VAR sign range/aim so that it measures and signals speeds over 30 at a point closer to the village gateway features – it is currently flashing too early. Failing agreement and delivery of all steps under (3), the fallback will be reconsidering moving this northern build-out 40-50m northwards (which side of the road would be considered further if necessary). The report will strongly advise that re-collection of traffic speed/volume data is necessary, to enable assessment of impact of the installed calming measures, against data from 2017. Further developments will be published here as soon as available. In general the safety audit noted that the design of the scheme in this area has been conditioned by the fact that the bends in the road militated against a build-out on the eastern carriageway, which would force southbound traffic into the path of northbound vehicles coming around a blind bend. The build-out on the northbound carriageway is, provisionally, considered viable, but the audit found that the details of the current implementation are causing some safety concerns that require addressing. Installation of new carriageway-edge road markings around the buildout and opposite kerbline to create a further enhancement and visual narrowing to the existing buildout. Further vegetation clearance to maximise visibility. In addition to these measures, Oakford Homes are liaising with Hyde Homes to investigate the scope to move (or remove) the close-boarded fence north of the northern buildout, to improve the northbound sightline. The audit has also considered the possibility of additional speed reducing features north of the current build-out (to slow southbound traffic). Once the first set of remedial works are completed there will be a further safety audit site visit to review the effectiveness of the initial measures and make a recommendation as to whether further works are required. WSP are now producing the technical designs and associated details that will then be forwarded to WSCC for final review and sign-off; Oakford Homes will progress the initial works above and are looking to complete this work as soon as possible. Over the past three weeks the Parish Council has repeatedly pressed the developer’s traffic scheme designers (WSP Consultants) and WSCC Highways to urgently agree and confirm the position relating to further works following the safety audit site visit of 10 October. The Parish Council is not a direct party to this process. Further contacts today seem to indicate that a statement will emerge next week. We will publish it as soon as possible. Traffic calming: the safety audit site visit of 10 October had been informed in advance by a summary of cllr/resident comments. Subject to seeing the resulting report, indications of likely recommendations relating to the northern pinch-point included a possible additional build-out further north on the east carriageway, and improved sightlines and visibility of features in both directions. The inspector seemed relatively satisfied with the southern pinch-point, but may recommend reinstatement of some of the road markings and additional road surface treatment in tandem with the new southern village gateway feature due to be installed soon on the north side of Jackets Hill. Additional works can be done under the existing S278 agreement as a framework, but an extra northern build-out would require another neighbour consultation process. The developer has asked for a list of works to be progressed quickly. The report will also recommend further collection of traffic speed/volume data to assess the impact of the scheme, although this will need to await completion of additional works. In relation to traffic calming, the stage 3 safety audit report had been issued to the contractor and WSCC Highways and its recommendations are apparently in line with the points reported to the last TPC meeting, but there would be a delay while parties digest the recommendations, before a confirmed summary of further works becomes available. (Action: Clerk to progress reporting of final agreed works to the community). Since installation of the new calming scheme, a number of concerns have been raised by councillors and residents about how the scheme works on the ground, including about the northern arrangement. It is standard that new schemes of this kind have a routine post-implementation safety audit led by specialists independent of both the developer and WSCC. That review is due to happen in the next couple of weeks and the PC will be feeding directly into that process, ensuring that key points of concern raised by residents are fully heard. We will report back to residents on the outcome of this process as soon as possible. Meanwhile,we are continuing to progress with developer and WSCC the reduced speed limit over Jackets Hill, which is due to be implemented in the first half of 2019. The Parish Council is pleased to report that the ‘pinch-point’ scheme for the 30mph zone of the B2139 Storrington Road has now finally been signed off and approved by WSCC Highways, and the works will be progressed urgently during this summer school vacation, with 31 August as the target completion date for main works. We look forward to this making a real difference to vehicle speeds in central Thakeham from this September. This will of course mean a month of temporary traffic light controls in this area. As and when the works require temporary relocation of bus stops, Compass Buses are being involved to risk-assess and organise temporary arrangements. The finalised scheme (which is effectively unchanged from the one consulted-on in January 2018) can be seen/downloaded here. We also welcome and fully support the recent initiative by resident Ian King to set up a Community Speedwatch group (see his recent Facebook post on our Community page). It will be important to monitor the impact of the pinch-point scheme, and even if it is successful for that area, there are several other areas of Thakeham with similar speeding problems, so we hope to work closely with this new group when it is set up. The Vehicle-Activated Signs at the boundaries of the 30mph zone are now finally operational. The pinch-point scheme is going ahead: negotiations between the Abingworth developer and WSCC Highways on fine detail of the design seems to be near complete, and the developer has stated the aim of getting the works done during the 2018 school summer vacation. Following the frustration of the installation of the vehicle activated signs in the Abingworth 30mph zone being set back by the contractor going out of business, latest news is that a new contractor has taken on this work and we expect installation to commence this month. The latest on the pinch-point scheme is that the consultants say that they are on track with translating the consulted design into a detailed agreement with WSCC Highways; we will keep pressure up for the work to start as soon as possible. Monaghans Mushrooms have also agreed to re-start steps (including a planning application) to re-shape the front of their site, with features to prevent HGVs turning north up the B2139. We have now finally received the revised/refined proposal for the Abingworth Phase 2 ‘pinch point’-based traffic calming scheme, which you can see and download below. The PC will be reviewing this scheme at its Neighbourhood Planning Committee meeting of Monday 23 October (6.30pm, Village Hall). The feedback that we give to the consultants who have produced the scheme will influence the detail of what is then formally submitted to WSCC Highways for approval. We want this submission to be made by the end of November, to allow sufficient time for Highways to consider/approve and for the developer to schedule the work for Spring 2018. Given the long history of resident concerns and the terrible fatal accident in March 2017, the PC is seeking widest possible community comments on the new scheme. You can give your input either by attending the meeting above, or email clerk@thakehamparish.co.uk by close of Friday 27 October. The PC’s planning group will take on board all comments received by then. 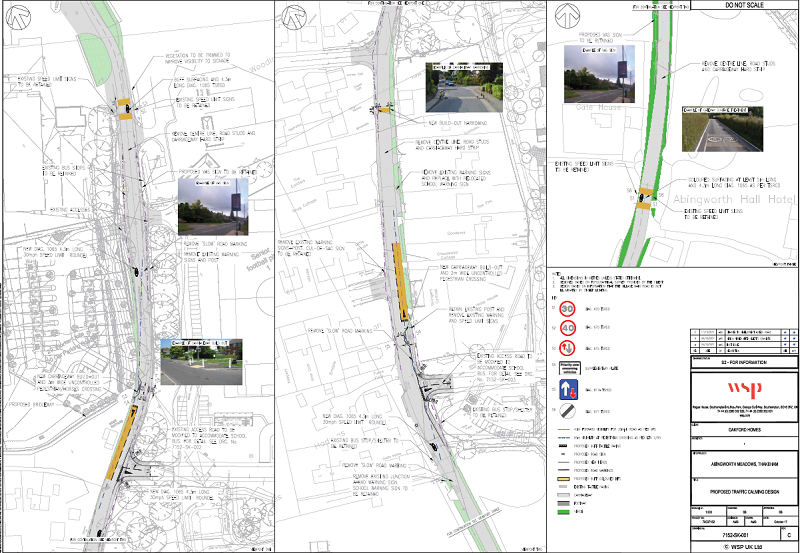 Abingworth 30mph zone phase 2 traffic calming proposals (revised). b) Scheme drawing Click below to view the plan; before downloading, be aware that this is a large document and a complex one – reading the detail may require you to enlarge the image in your viewer. Although the scope of the proposals above are limited to the Abingworth 30mph zone itself, we are also continuing to pursue the extension of the 40mph limit from the northern edge of Storrington over Jackets Hill. WSCC Highways and Sussex Police have indicated that they are open to this, subject to the lower speed limit being supported by vehicle-activated speed signage, and financial commitment to this was secured from Abingworth Homes as part of planning permission granted for the revised phase 2 housing scheme in April 2017. We will continue to progress this in parallel with the scheme within the 30mph zone, aiming for implementation in 2018. We have continued working with the developer and WSCC Highways to deliver the ‘phase 1’ traffic calming measures around the Abingworth 30mph zone that have been approved in principle by HDC planners. These works comprise: vehicle-activated signs (VASs), village gateway features, and signage upgrades. Progress has been frustratingly slow due to the many steps required to get relevant Highways approvals and infrastructure in place (e.g. electrical connections to the locations of the VAR signs). However, we do seem now to be finally on track for this work to happen in November 2017. WSCC Highways are responsible, and are the decision makers, on all matters relating to roads, and road safety. Where road layout and safety issues are linked to housing/business development projects, that also brings in the Horsham District planning process. As in the case of the Abingworth development, planning agreements can provide funding and design proposals for certain road improvements, but the detailed design still has to be agreed and signed off by WSCC Highways. That process involves statutory consultations, including with the police, which are led by the developer. The PC’s role is to consult with and, via these processes, act as the voice of the local community to push for the changes that our residents want. Both bus shelters will be replaced/reconstructed. During these works, temporary bus stop arrangements have been agreed with Compass and WSCC Education Travel team. We also need improved pedestrian crossing arrangements around the northern Abingworth junction, which is where the new shop and village hall will be. Following directly on from the southern works above (i.e. May 2017) will be works to improve sightlines and the pedestrian crossing arrangements around the northern Abingworth junction. This will include moving the current crossing north of High Bar Lane to a better visibility point slightly further northwards. The Parish Council’s view that there remains more to do to make the school bus pickup points safer (preferably off the Storrington Road altogether), as well as continuing to improve pedestrian crossings. We will continue looking into the options and opportunities as the Abingworth development moves forward. The PC has agreed designs for the following further works with Abingworth Homes, but details and timing of delivery remain dependent on HDC planning and WSCC Highways consultations/approvals – see ‘who does what’ above. The phasing below relates to planning technicalities, but the timeline that the PC and the developer are seeking to work to is to deliver as much as possible of both phases below by early autumn 2017. New village ‘gateway’ features and speed indicator devices at both south and north ends of the 30mph zone. Further improvements to speed control signage and road surface treatments, including ’30mph’ roundels. The planned further works are as below. The detail of this is subject to further consultation with WSCC Highways, residents and other consultees. The addition of several further build-outs into the B2139 roadway to create a ‘pinch point’ priority system enforcing the 30mph limit through the whole 30mph zone. a new bridleway crossing near the northern access junction (at the southern edge of the new local worker housing). This will form a westward extension of the new east-west bridleway through the Abingworth site, which will rejoin High Bar Lane near the playground. The design involves the east side of the crossing being built out into the road. New footway along the east side of the B2139 north of Merrywood Lane, creating a safer link for pedestrians/cyclists between the edge of Storrington and existing bridleways and footpaths to the Abingworth area. This will include upgrading the full length of the Strawberry Lane bridleway. We remain concerned about the safety of pupils commuting on foot/bicycle near the Rock Road school site, both at the Water Lane roundabout, and on the footways northwards, which cross the busy B2139 several times. Thakeham PC and Storrington & Sullington PC are pressing WSCC Highways to bring forward improvement schemes. Frustratingly, Thakeham already has potential funding available to assist with this (£60K from a past development), but has so far been unable to get WSCC to engage with this. This junction, and the stretch of the B2139 to the south, are dangerous with many recent minor accidents and near-misses. Although WSCC Highways have rejected a proposal for a new 40mph speed limit on the bends south of Picketty Corner, they have agreed to implement improvements to signage, road treatments and vegetation cut-back which should improve warnings to motorists and sight-lines. This is a dangerous junction with very poor sight-lines for drivers emerging from Crays Lane to turn eastwards onto Goose Green Lane in a 60mph zone. WSCC Highways have agreed to add improved signage and vegetation cut-back works to their list of upcoming improvement works. We will move on to prioritise these areas as soon as possible.